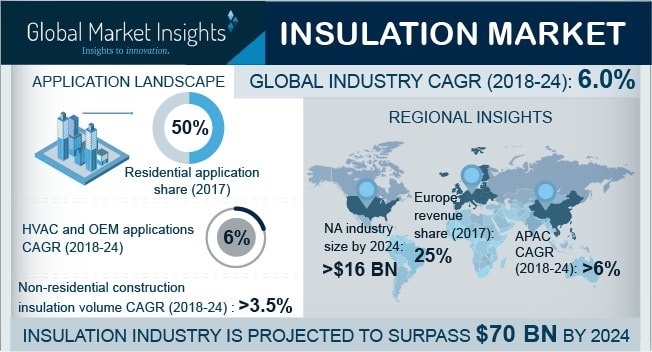 Insulation Market size is estimated to surpass USD 70 billion by 2024; according to a new research report by Global Market Insights, Inc. Rising concern pertaining to global warming along with high electricity bills will drive insulation market size. Implementation of more stringent building codes to promote energy efficient building construction by adding or replacing insulating materials in both residential and nonresidential structure will drive industry growth. Increasing adoption of new building techniques offering superior performance in line with upgraded building regulations will propel the product penetration rate. Increasing public private partnership for new residential construction is likely to propel insulation market demand. Global construction output was valued over USD 8.8 trillion in 2016. Surge in application of advanced insulating materials across industrial and commercial application to reduce energy consumption and meet the energy conservation norms likely to augment insulation market growth. Customers are continuously focusing on building renovations with substantial energy conservation. Rapid expansion of industrial sector driven by attractive monetary policies will provide strong business outlook for manufacturers. Proliferating demand for green construction to minimize carbon footprint, enhance work productivity, improve thermal comfort, etc. will propel insulation market demand across industrial sector. Insulation market from residential construction is estimated surpass USD 36 billion by 2024. Positive application outlook in residential buildings offering proper insulating requirements and sufficing the building codes laid by the regulatory bodies will fuel the product demand. Increasing demand for the products that enhance energy efficiency and assist in energy conservation are among key factors supporting the segment growth. Non-residential construction insulation market is expected to witness CAGR over 3.5% in terms of volume up to 2024. Expansion in global commercial construction industry with focus on reducing energy consumption has enhanced the product demand. Creating optimal comfort in every climate and offering occupant consistent temperature irrespective of the outer weather are among major properties positively influencing product penetration. Europe insulation industry is expected to hold over 25% revenue share in 2017. Green regulations concerning fire safety, air quality, acoustic comfort and resource efficiency will drive insulation market demand. For instance, The EU Directive 2012/27/EU for Energy Efficiency (EED) focuses on improving energy consumption in member states by curbing energy usage in buildings and renovate 3% of public owned buildings occupied by the central government with area of more than 250 square meters on an annual basis. They are required to propose road maps for renovation of buildings by 2050. Asia Pacific insulation market demand will witness fastest growth over the forecast period. Emerging economies notably Malaysia, Vietnam and Indonesia are expected to invest substantially in new infrastructure projects, funded by both public & private investment. Increasing demand for new residential construction owing to rise in per-capita disposable income will propel product application rate. In addition, rapid construction of malls rapid construction of commercial buildings, malls, and sports complexes will augment regional insulation market size. Global insulation market share includes Owens Corning, BASF, Atlas Roofing Corporation, Duro-Last Roofing, Inc., CertainTeed Corporation, The Dow Chemical Company, Huntsman International LLC and Rockwool International. The industry participants are focusing on integrating the operations across the value chain. For instance, Huntsman International is involved in polyurethane production as well as manufacturing insulating products. Rockwool International holds their own distribution network along with the product manufacturing.